Firstly, start by logging into your Adsense account using your email address and password you supplied during sign up. 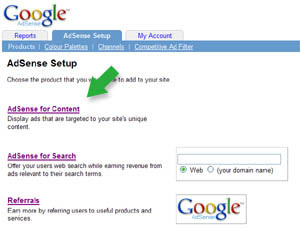 Once logged in, select the 'Adsense Setup' tab panel - this is where you can create the different Adsense formats. Select 'Adsense for Content'. You will be directed to a form that provides options to fully customize the look of your ads, such as selecting ad formats, sizes and colours. We recommend that you select the Single Page option to save time clicking between pages. Its easy to copy the code - simply click inside the textbox and the code will automatically be highlighted for you. Now hold down the 'Ctr' key and press 'c' on your keyboard to copy the code into the clipboard. 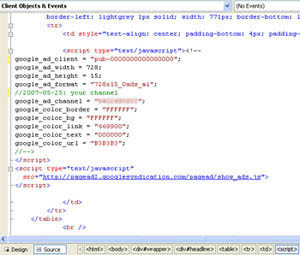 Depending on your type of web page editor, you will need to view the 'source html' and then paste the Adsense code directly into the html code. That's all there is to it! Now, you will need to publish the web page with the new Adsense code added. 3. 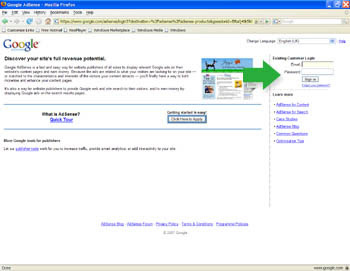 Pay attention to the Adsense rules and guidelines, which limit you to the number of Adsense ads you can show on a page. The limit currently is; 3 Ad units, 1 Link unit, 2 Adsense for Search boxes and a maximum of 2 Referrals (of the same product). Check the most up to date rules to be sure you are not breaking them.